Lewiston, ME - Eric E. Hirshler, a longtime Granville resident who had retired to Lewiston, Maine, died August 30, 2017, at age 93. He loved art museums and cathedrals, Roman ruins and archeology, old master drawings and early modern German painting, opera and classical music. He loved to learn. He is much missed by his many friends and by those whose lives he expanded. Married for fifty-one years to Marilyn Nair Hirshler (1931-2004), he was the son of Lewiston physician and surgeon Dr. Max Hirshler and Dr. Helene Hirshler. 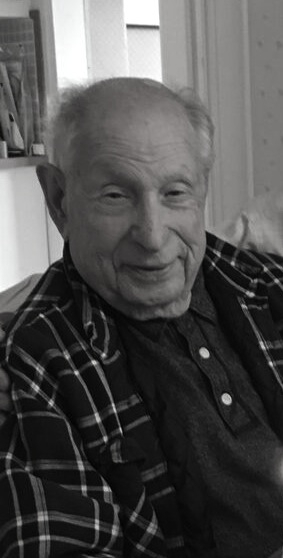 Born in Germany in 1924, Hirshler came to Maine in December 1938; he earned his BA at Bowdoin College (1946) and his MA and PhD degrees at Yale University. In the 1950s he worked in New York City at the United Restitution Organization, at UNESCO, and at the Leo Baeck Institute; he also began his long career as a professor, first at Rutgers University (Newark) and at Brooklyn College. In 1959 he joined the faculty of Denison University, where he first taught German language and literature (1959-1965) and then became Professor of Art History (1966-1989); he served as Chair of the Art Department from 1965 to 1972 and director of the art gallery from 1967 to 1970. During a leave from Denison, he was Chair of the Department of Art History at Carleton University in Ottawa, Canada (1972-1974). Fascinated by human history, Hirshler spent several summers as the principal investigator of the archeological excavations in Sremska Mitrovica (Sirmium), in Serbia. He was the author and editor of the book Jews from Germany in the United States and he wrote a number of articles and numerous book reviews for academic journals. He was the recipient of grants from the Kress Foundation, the Lilly Foundation, and the Denison Research Foundation. Professor Hirshler returned to Lewiston following his retirement in 1989. He volunteered at the Bowdoin Museum of Art and occasionally offered lectures at Bates College. He was a dedicated Friend of the Lewiston Public Library, serving on the Board of that association and establishing the Marilyn N. Hirshler Book Fund to support the library’s acquisition of books about art and architecture. His intellectual curiosity never waned, and he shared it with his favorite caregivers at Aging Excellence and, during his last week of life, with the merciful women at Hospice House in Auburn. His last regret was his unfinished book review about Austrian artist Egon Schiele. Dr. Hirshler is survived by his daughter Erica Hirshler, a senior curator at the Museum of Fine Arts, Boston, and her husband, Harold Clark. A private memorial will be held this fall. Donations in his memory to the Marilyn N. Hirshler Book Fund at the Lewiston Public Library (200 Lisbon Street, Lewiston, ME 04240) would be welcomed.